Bumpers are objects that appear in New Super Mario Bros., Super Mario Maker (in version 1.30 or later), Super Mario Maker for Nintendo 3DS, and Super Mario Maker 2. 1.1 New Super Mario Bros. In New Super Mario Bros., they appear in World 1-A and World 8-3 exclusively in underwater sections, and bounce Mario against the direction in which he swam towards them. They appear as olive-colored bubbles with a star-shaped plantlike symbol on or inside them. In Super Mario Maker and Super Mario Maker for Nintendo 3DS, they can be created by shaking a Grinder in editing mode. Their appearance now resembles that of an innertube with eyes. 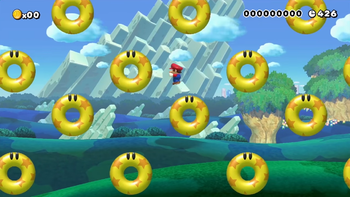 When Mario jumps on one from above, it can bounce him higher, having a similar function to Trampolines and Note Blocks. If Mario makes contact with one from the side or below, it bounces Mario away, serving more as a hindrance than an aid. In the Super Mario Bros. theme, Bumpers are striped light and dark green, with eyes similar to that of Mr. Eraser. In the Super Mario Bros. 3 theme, they are checkered green and white, similar to the Jump Blocks from New Super Mario Bros. Wii and with the same type of eyes. In the Super Mario World theme, they are white with pink diamonds and beady eyes. In the New Super Mario Bros. U theme, they are yellow with orange stars, resembling Lemmy's rubber balls from the New Super Mario Bros. series, also with beady eyes. This page was last edited on March 30, 2019, at 16:30.